It is not a mystery that we are very interested in everything which is fresh and (really) new in HiFi. For example, we have focused our attention on Class D amplifiers, following our exciting review of the T-Amp. 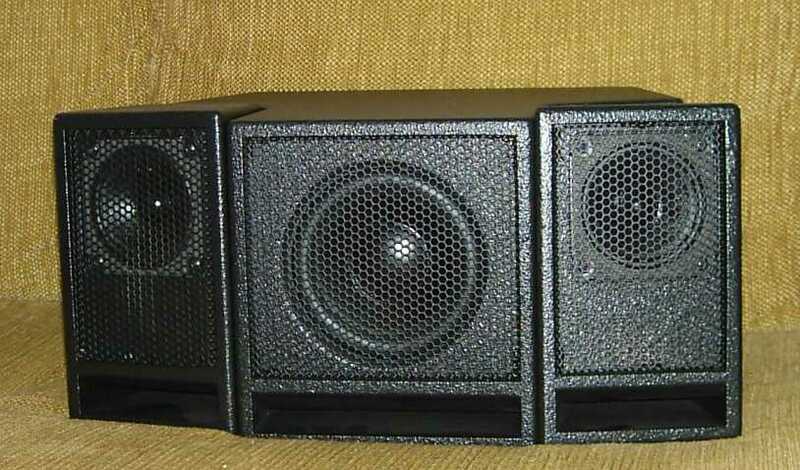 Recently, we have also devoted some article to active loudspeakers as we believe these can be extremely interesting. Hence, could we escape from the possibility to review an active speakers system powered by Class D amplifiers? So here we are with this sub + sats active system, designed, engineered and built in Italy by Aux/Outline. The super-compact system, called Aux Out 400, uses two Class T (yes, Tripath TA2022) amplifiers and a single LINE IN input, meant to give "voice" to any device with a LINE OUT (or AUX OUT, hence the name of the device): compact disk players, DVDs, iPods, notebooks, PCs etc. The system, when "packed", is a very compact cuboid which measures 42 x 20 x 30 cm. Various finishes are available: a so-called "rugged" black (PA-style, see pic above), a flashy Ferrari red, a trendy iPod white and a classic black piano lacquer (visit the official website for flashy pics). It makes use of shielded drivers so that it can be safely placed close to TV sets or PC monitors. As said, the system uses two sats and a small subwoofer. The satellites use a 10 cm full-range driver, made by Ciare, loaded by a very small reflex enclosure. Yes, there are no tweeters, just a small full-range that covers the 150-20,000 Hz frequency range. A diminutive 0.5 mm2 wire connects the sats to the main unit, by means of RCA connectors at each end. 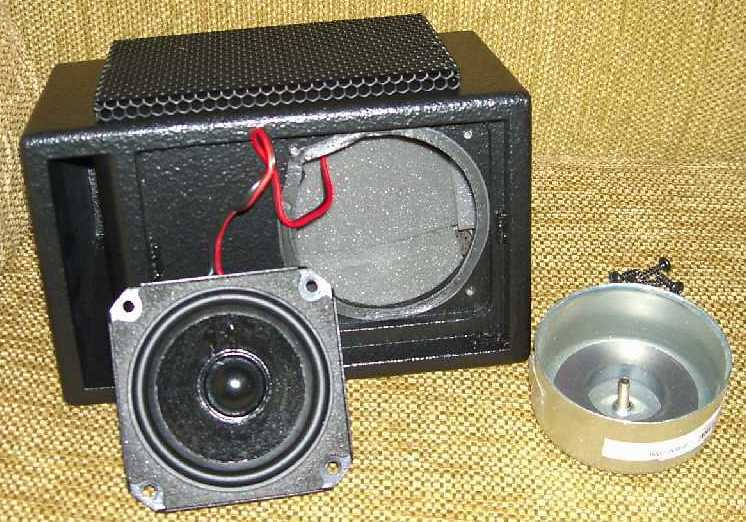 The main unit sports a 14 cm dual-coil long-throw woofer, still made by Ciare, also loaded by a reflex enclosure, with a front firing rectangular port. The choice of a single dual-coil driver helps keeping the size of the unit small. Actually, it is a very common solution in systems like this. 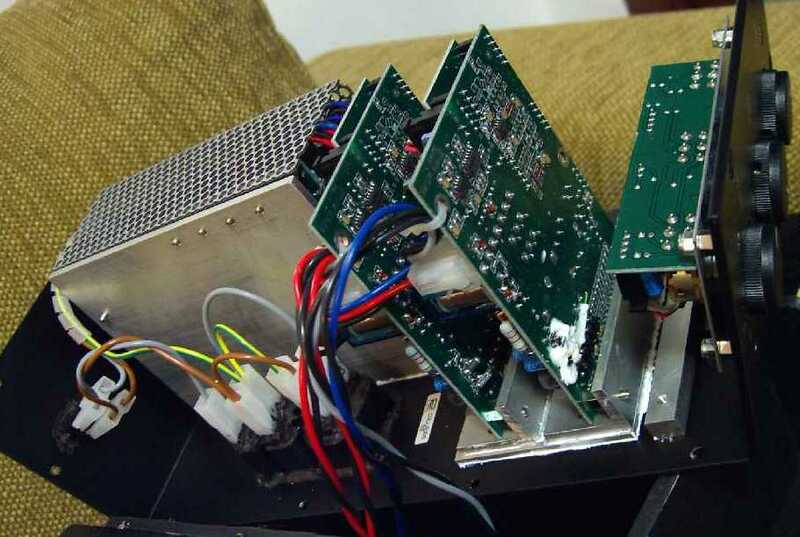 Inside the main unit there are two power amplifiers, based on the TA2022 chipset by Tripath, and a small electronic crossover that crosses sats and sub at 150 Hz. One power amplifier serves the woofer, while the other is dedicated to the sats. The manufacturer claims the system is capable of 400 watts RMS which isn't 100% true. Unfortunately, the power output claims for this kind of products are always very, very optimistic. 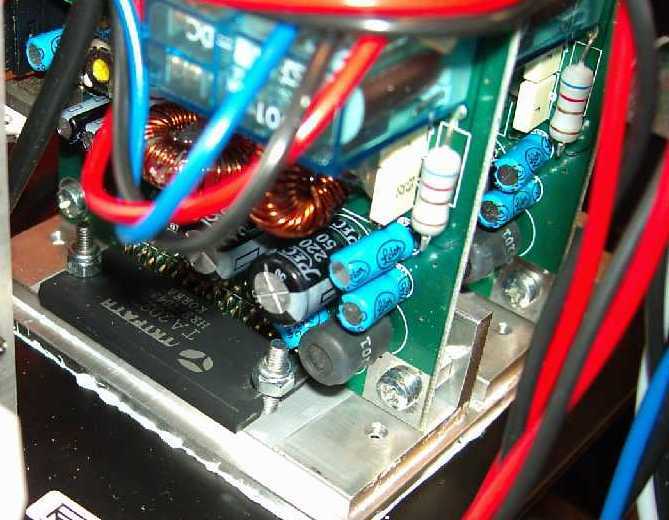 Indeed, the TA2022 chipset produces 60 watts RMS (at 0.1% of THD) on a 8 Ohm load and 90 watts on a 4 Ohm load, as one can directly verify on the Tripath PDF datasheet. Considering the sats have a nominal impedance of 8 ohms and the subwoofer is a 4+4 Ohm driver, we're talking of a 60 + 60 watts real output power on the sats and 90 + 90 watts on the subwoofer. Moreover, since the sensitivity of the drivers is unknown, the power output datum alone says almost nothing. All one can do is measure the max sound pressure level in a standard listening room, which is what I did, actually. Armed with a digital sound pressure level and installed the speakers as a standard sub + sats system (sub on the floor, sats on stands) I measured peaks of 105-106 dB, into a small room (18 sqm) at 2 meters of distance from the system (before clipping, of course). Considering the small size of the system, this datum has to be considered impressive. Above that, the system reaches its natural limits. 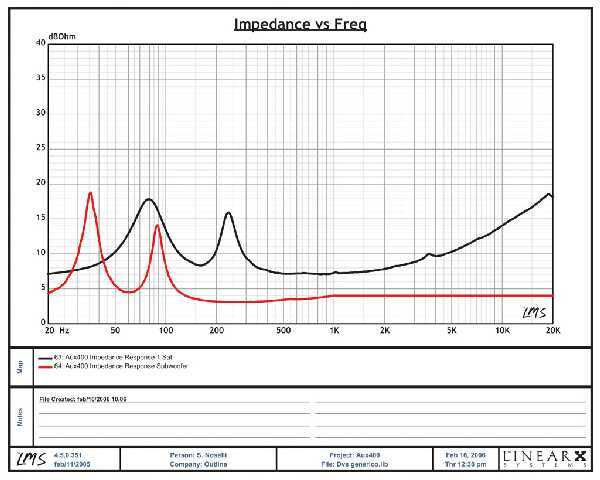 From the manufacturer supplied frequency response and impedance graphs (see below) one can easily see which are the limits of the system: the subwoofer frequency response hits the -3dB point at 50 Hz, there's a boost at 70 Hz and then gradually drops till 150 Hz. The full-range unit, instead, shows a frequency response which goes up till 10 kHz (a whooping +6dB over the 1 kHz level!) then drops rapidly over 12 kHz...as one may expect, considering the unit isn't a tweeter! Roughly speaking, the subwoofer isn't a real sub-woofer, considering its size and its frequency response. Its job is concentrated in the short 50-150 frequency range. The 150 Hz crossover point is inevitable if one wants the subwoofer to become acoustically invisible. Above that frequency the human ear starts to detect the source of the sound and all the "magic" disappears. Other sub + sats active systems force the woofer to reproduce a larger part of the audio spectrum (because the sats are unable to reproduce the mid-bass range...) and hence the unit becomes "visible", for example when reproducing male voices. Having a close look at the power amp boards, they actually seem the official Tripath evaluation boards (EB-TA2022), with minor changes. Even the heatsinks seems to be the same. When asked, the manufacturer replied these boards have been designed and engineered from scratch, so they should be considered "new" by all means. The main unit has a power on switch and three potentiometers: one for channel balance, one for "master volume" and one for subwoofer level. This means one can adjust the level of the subwoofer accordingly to his personal taste. For a "neutral" balance with the sats the manufacturer suggests to keep this control set at 3/4. A standard IEC mains socket is paired with another "female" IEC socket that can be used to supply an external source (a CD player, for example). This way the power on switch on the unit acts as mains on/off control (you can switch on/off the unit and the source with a single click). I've had the possibility to test this unit over a period of nearly three months, and I've used it to give "voice" to any source I have at home, included my Fujitsu-Siemens notebook. I've listened to this system like it was a standard pair of loudspeakers, installing it in my new listening room following audiophile guidelines. I had no prejudices, just pure curiosity, and I was excited by the fact this is one of the few Tripath-powered active system on the market. The tonal balance of the AUX OUT 400 is heavily influenced by the full-range drivers which have been used. These tend to underline the mid-high frequencies (remember the +6dB boost at 10 kHz!!!) while they definitely roll-off high frequencies. This translates into a sound which is "rounded" in the highs, definitely easy on the ears, even at loud listening levels. Voices appear thinner than they should be, especially male ones. Overall, the good level of transparency makes the audition enjoyable. The blend between sub and sats is almost perfect, in the sense it is hard to perceive any sound as coming directly from the subwoofer unit. This notwithstanding, a kind of "step" between the two units can be heard, from time to time, as the frequencies near the crossover point are reproduced differently by the subwoofer and the sats. The woofer, considered its diminutive size, plays miracles: of course it fails to reproduce the first octave but its "punch" is very convincing and so is the articulation of the bass lines. Obviously, one can't ask for too much: when asked to reproduce very deep bass frequencies at high listening levels it simply gives up. I've had serious troubles when trying to reproduce Philip Glass's "Koyaanisqatsi", the first track of this masterpiece (soundtrack of the famous Godfrey Reggio's movie - 1983). A very powerful and deep organ pedal puts the small woofer in serious trouble, even at moderate listening levels. There's an added vibration or noise coming from the woofer unit that is a mixture of air turbulence and internal vibrations. At a more accurate investigation I've discovered there were both an air leak in the RCA sockets panel and a vibrating noise coming from the inside. I suspect the power amps boards are free to vibrate, excited by the air flow. The same has happened with other "difficult" tracks as "Angel" (from Massive Attack's "Mezzanine") and "Sad old red" (from Simply Red's "Picture book"). Incidentally the manufacturer had sent me, by mistake, two samples so I've had the possibility to test a second unit. With the second main unit there wasn't the RCA socket air leak but the internal noise of the boards was even louder, making the listening experience quite embarassing. I've been forced to give up listening to those records. If one excludes these "difficult" situations (extremely low bass frequencies), the sub seems to be able to cope with any request one might have. Conversely, the sats start screaming (or clip) way before the subwoofer does. One of my questions before listening to this system was: will I be able to "hear" the sound of the Tripath amps inside? As I have a TA2022-based integrated amp on test I am pretty familiar with the sound of this chipset. Actually, something "familiar" can be detected: a good introspection ability, a nice level of transparency and openness in the mid range plus a certain attitude to retrieve hidden details. Also, a kind of smoothness can be detected too. The TA2022 isn't similar to the more famous TA2024 (T-Amp) chipset: it is warmer, somehow smoother and...slower. Even the power output seems less than it actually is. This is a very strange sensation that I can't adequately translate into words (let aside my poor English): just imagine an engine that starts pushing strong only when revved high (the "low torque, high revs" kind of engine, if you know what I mean). Finally, the tonal balance between the bass and the mid-high range is user-adjustable so I can't comment. One just adjusts the sub level accordingly to the musical program or his personal taste. I know this is by no means an audiophile attitude or good practice but...the system hasn't been designed having a die-hard audiophile in mind. The power output of the Class T modules is adequate, even excessive for the drivers. 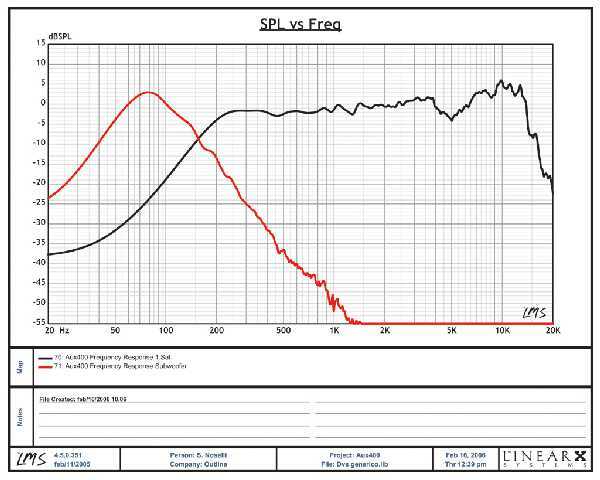 Average sound pressure level, in a medium listening room, is sufficient, considering one can easily exceed peaks of 100 dB's at the listening seat. It is nothing that will make your walls tremble but the impact this system possesses is certainly enough most of the times. Of course, it all depends on your listening habits: for many audiophiles (and their friendly neighbours ;-)) 100 dB's are more than enough, and even 90 dB are considered "very high listening level". This partially explains why many of them have found - for example - the lowish T-Amp power output adequate even with < 90 dB/w/m speakers! Of course, I'm referring to "peaks" here, not to continuous +100 dB sound pressure level (which is dangerous). Summarizing, the max SPL you can get out of this active system can be sufficient most of the times. The real problem - because of the nature of the drivers - is a certain dynamic compression at any listening level. The jump between pianissimo and fortissimo is somehow reduced, constrained. If you consider the system has been designed having compressed MP3 files in mind (as music source), everything seems logical. But since I'm evaluating the system in an abstract "audiophile" environment, dynamic compression becomes a problem, a source of complaint. This aspect, paired with a certain laziness which is familiar with the TA 2022 chipset, makes the sound less lively than one may expect. In the bass range, dynamic jumps are limited by logical physical limits of the small driver. If you ask for too much, the small unit reaches its natural limits and starts making an alarming "clac-clac" noise, that of the voice coil hitting the end of its "travel". All of these aspects and limitations, of course, vanish when the system is used as a "desktop boombox", in near field applications. When the system is installed following strict audiophile standards (sats on stands, sub on the floor) one can enjoy a quite surprising soundstage, with a reasonable sense of depth, also. Horizontal planes appear a bit too close one to the other but I'm pretty sure correct soundstaging wasn't one of the main goals of the design. Since the sats are very small (and equipped with a single small full-range) they tend to disappear. When listening "in axis" it is very hard to tell from which direction the sound is coming, as it is the space between the speakers that "sounds". Another "surprise" is the presence of that elusive "third" dimension, i.e. the height of the stage. This is something hard to achieve even with more audiophile-oriented products. The height of the virtual image extends way above the line of the speakers. For this reason organ pieces sound very realistic (within bass range limitations, of course). I guess the almost "point-source" emission has a lot to do with this elusive phenomenon. The system needs a long "break-in" at high listening levels. Both the subwoofer and the speakers need some initial heavy work out before their suspensions start to perform at their best. I'd suggest 50 hours at least, before you can start evaluating the system. The best position for the system is as follows: sats on high, stiff stands, so that the fullrange unit axis is "in line" with listener's ears when seated; main unit on the floor, in the middle between the sats. Since the fullrange units are highly directional, if you listen to them "off-axis" you will lose most the high frequency content. As for subwoofer level...you'll be tempted to exaggerate, first. After a pair of discs you'll find the perfect balance with the sats level and will stop experiments. Do not forget this is a digitally amplified system. This means that using a tuner might be a problem as the amount of interferences won't let you tune a single FM station. No matter how hard I tried...no game: FM tuning was impossible even when the FM antenna was a couple of meters far from the main unit. I've had better luck with an old analogue tuner but all I've been able to do was detect a single FM station...with lots of background noise. This is not a problem of the AUX OUT system in itself. Most of the new "Class D" components (NuForce amps included, for example) have the very same problem. So, if you plan to use a tuner near this system...you've been warned. Finally, if you have children or pets pay some extra care to safe and accurate sats positioning. Since they don't have any kind of "grip" (no rubber feet) and are extremely light it is very easy to make them fall. This may be dangerous both for the speakers AND for children. The cabling system is definitely ugly, though it may appear plug & play at a first glance. The RCA connectors are not standard for power cabling (I've never seen a RCA used for power connections) and this makes using different cables impossible. For example, if you need a longer cable you'd be forced to buy some bare wire and then solder it to the RCA connectors. Considering decent speaker cables are normally not less than 2 mm2 thick you can imagine how hard the soldering procedure might be: RCA connectors don't have enough room inside! Furthermore, I'm pretty sure the hair-thin supplied cables can deteriorate and compromise overall performance. Of course, because of the RCA system, I haven't been able to test different speaker cables. I suspect the RCA connectors aren't fully CE-compliant, since the live wire is exposed and the user can touch it very easily. Oh yes, it is low voltage but still 60 watts on a 8 ohm load. Definitely NOT a line level output! The system is claimed to be "portable". Actually there are no handles or safe grips to lift and take it away. Moreover, the sats don't lock into the main unit so the only way to move the whole system is put it into its original carton box. I'd suggest including some Velcro (TM) straps to secure the sats to the main unit, for example. Considering the price tag (1000 €) a small, soft bag could have been included. Neither sats or sub are equipped with feet of any kind, not even the ubiquitous rubber dots. As said, this makes sats quite dangerous. I'd suggest putting three small drops of blue-tac between sats and stands (or bookshelf) for a better and safer interface. Potentiometers are hard to reach, if you place the main unit where it should be (on the floor). Since there isn't a remote control, adjusting volume level or sub level can be annoying and a real pain ...in the back! :-) Other systems like this use remote controlled potentiometers or place the pots on the sats, within hands' reach. Three motorized pots would have solved the problem. The system came with a strange, unusual 1 year warranty. When asked, the manufacturer replied the system has a lifetime guarantee instead. No user manual is available (yet?) and this isn't good if you consider the average customer of a system like this (certainly not an expert audiophile). Finally, two words on "value for money". The system has been designed following other similar components like the Klipsch ProMedia 2.1 we reviewed a couple of years ago. I'll make a quick comparison between these two systems. The sound pressure level is the same, but the ProMedia offers a wider frequency response (extended till 30 Hz) which made it earn the famous THX-LucasFilm certification. Of course this is possible because the ProMedia subwoofer is bigger. The ProMedia sats are a real two-way system, with passive crossover and a Tractrix horn tweeter. Incidentally, the crossover frequency between sub and sats is exactly the same (150 Hz). The Klipsch system has the adjusting pots on the sats and offers even a headphone output jack. The ProMedia 2.1 is no longer made but is still available, for example on Amazon.com, at 120$!!! Now it has been replaced by two improved products, the ProMedia 2.1 GMX and the iFi, a kind of iPod dockstation. Both offer a remote and cost, here in Italy, 180 and 340 € respectively. The iFi uses a Class D power module (perhaps a Tripath?) and, like any other Klipsch system, offers impressive performance: max SPL, for example, is claimed to be 114 dB at 1 meter! Its frequency response is claimed to extend from 27 to 20,000 Hz. Now, given the price tag of the AUX OUT (nearly 1000 €), which is almost 6 times the price of the ProMedia, one might expect a far higher quality or a better enginereed product. Not exactly so. For example, it lacks a minijack line input (useful with portable sources!) and a remote. It doesn't even have tweeters...though this has been a precise designer's choice, in order to give the system a less fatiguing sound. I might add that - in systems like this - tweeters are the first components that might be broken (by misuse). A possible explaination of the giant price difference can be found if one investigates on the Country of origin. Apparently the AUX OUT system is entirely made in Italy while its natural competitors are made in China. Also, the AUX OUT system retail price includes shipping everywhere and that's a plus. Anyway, when all's been said and done, it seems the price difference is still too high. In other words, the AUX OUT system is, in my humble opinion, too expensive. For the very same money one can buy an audiophile amplifier (with the same power output) and a pair of floorstanding speakers that will give this small system a good run for the money. From a strict audiophile point of view, this system is not a good choice. As a small, compact, almost portable :-) multimedia system it might be recommended but a couple of technical problems should be solved first: those noisy air leaks, boards rattle, lack of remote and minijack input. Moreover, it should cost much less (half than that?) as the competition is tough and becomes tougher day by day. Oh yes, it is true there might be similar systems that sound worse and cost even more...but this can't be considered a good excuse. Sound. Some dynamic compression and a certain laziness make the system less lively and involving that one might expect. The mid-high range is a bit prominent and sounds a bit boxy too. The high range, in my opinion, is too behind the rest of the audio spectrum. Aural sensations and technical measures coincide, here. This lack of high frequencies damages the harmonic content of the Music, its airiness and corrupts details faithful reproduction. It is hard to write down a kind of conclusion without having in mind the steepish required price. The system, overall, sounds good, with an amazing bass range (considering the size) and is capable of adequate sound pressure levels. The problem is that I can't avoid thinking about the 10 x 100 € bills you need to shell out to purchase it. Anyway, commercial success has nothing to do with good quality/price ratio. There are systems and components that have become extremely popular with ridiculously low Q/P ratios. The coolness factor and "perceived quality" are key factors here. The AUX OUT system, considering the attractive finishes and its very compact size, can quickly become a "classic" or a "must-have" for the Pod generation, for example. Moreover, when people don't know how to evaluate a system, they take into consideration its retail price: if it is expen$ive (more than the competition) the system MUST be good. Right? The bottom line is: would I recommend it as an "audiophile" system? Certainly not. As said, for the very same price one can buy much better gear (a standard amplifier and a pair of good speakers, for example). Would I recommend it as a compact multimedia system? Maybe. But the Company should solve a couple of annoying technical problems and, if possible, lower its price tag. loved your review! I knew that a true "hi-fi"er would be a real challenge! From a no-compromise "hi-fi" point of view, your review is perfect. I think, however, you need to remember that this product was never meant to be "hi-fi" - it was meant to be small, simple and elegant enough to find its way into every room in the home - especially onto the desk - all hostile places where we don't have the luxury of organizing the furniture around the stereo, but rather need to "hide" the stereo amongst the furniture. The Aux Out 400 isn't meant to replace your hi-fi, but rather bring music back into the rest of your life. Luxury Music. And like it or not, most of the music world is becoming mp3. As the designer Guido Noselli preached throughout the 4 year development of this little box, the laws of physics were against us - some compromises were necessary. We were not, however, willing to compromise musicality. We also set out to beat once and for all the irritating phenomena of listening fatigue; your review more than confirms our success: "The woofer, considered its diminutive size, plays miracles", "another surprise is the presence of that elusive third dimension .... hard to achieve even with more audiophile-oriented products". Glad you noticed! As for the price, when volume production goes up, the price will come down - right now we "pay" for a limited "made in Italy" production which will prove over time to be a great investment. We could have said €700 + vat + shipping (the ProMedia 2.1 sold for €350 + shipping more than 4 years ago). You do the math. "beta" - after 3 years in the lab, totally new amps, new 3" full range, new 5" sub, real production run of 100 units - hard to call that "beta", we are more than 4 years into this project! "400 watts" - it sounded better than 2x90@4ohms+2x60@8ohms - the reality is that these 4 t-amps are capable of 100 watts each at 4 ohms with 1%thd. Sure 90 watts @ 4 ohms .1% thd is a better audiophile description - our competitors, however, use numbers with 3% thd! The fact that these sats are 8 ohms (hence 60 watts) is a design detail not indicative of the true power of the amps. "non linear reproduction" - meant to minimize listening fatigue at near-field for hours and hours of continuous listening pleasure. If you want to flatten it, use your computer's equalizer! "exceeding their limits" - we've balanced the "line" input for the weakest of signals (iPod with limiter) so that you can still get full volume - as a consequence, with a good "line" input you can turn them up too loud and push them into distortion (though at near field you won't even get close!). The design objectives were for small rooms and near-field, but as you discovered they work pretty darn well even in larger rooms with strong volumes - not bad for their size! We've got musicians playing small concerts with them. "vibrations" - like above, you can turn them up too loud depending on the source - and yes there are a few lower frequencies that can cause some disturbances, but all in all an amazing range of frequencies comes out of them covering 99.9% of our daily listening pleasure. "hooks, feet" - they are made of wood - you can screw or glue anything onto them you like depending on your installation needs. "rca for speakers?" - seemed like a good idea at the time! In fact they are very easy and functional for quick set-up. Likely to be changed in the future, also because they are expensive and hard to seal! "no remote" - most sound sources have their own remotes - motorized pots don't last forever and need to be cleaned - with a lifetime guarantee, we need to stick to extremely reliable components. "no manual" - so far everyone else has thanked us for that! It is so so simple, we were even considering advertising it as "Luxury Sound - no manuals included". There will eventually be a manual and a website for installation considerations . . .
We've completed development of a 3" full range driver with even greater frequency range and dynamics. There is a remote control in the works. Carrying cases are being developed and will be available soon. Many different models from generic to professional to Fashion brands - the Aux in a Box system will be the first truly transportable boom box that rocks.